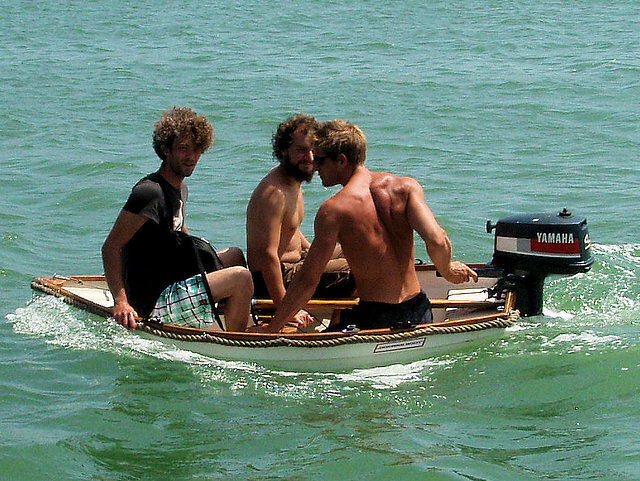 Later that week, we were joined by charming Jo G. I bought a moribund outboard off my Frenchie neighbour, whom I had met in Camarinas before, tried to calibrate it for a day, and stuffed it into big hole (port side locker for you nautical geeks) for future reference. Following a bit of fiddling of the anchor and a few other maintenance chores, we were ready to go to Nazaré, which entailed motoring about in lots of swell and very little wind. The classic Portuguese Nordeiro wasn’t really working for us in that it either wasn’t present or a bit too strong, a sign of impending climate collapse no doubt. The marina in Nazaré is run by a retired master mariner from England, a real character, who doesn’t want anyone to leave, wildly embellishing the weather reports and talking about gales and monster swell. With some success, forcing us to have a prolonged stay on the fishing dock since the marina was overflowing with other boats waiting for a break in the 6-7 bf onshore with 3+ metres of swell. Nazaré is a pretty if somewhat touristy place, and we all soon had a nice sunburn to show for our beach visiting efforts. 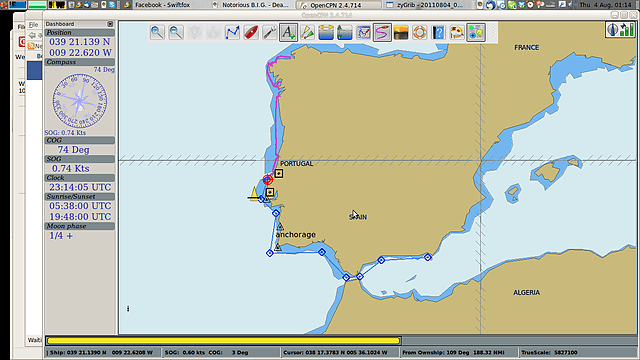 Eventually my old friend (and master mariner) Nils and his partner Sybill arrived, and we decided to depart for Peniche in spite of the adverse conditions. Survive to tell the tale we did, although just about everybody felt a bit nauseous from the swell-induced tumble dryer action. In Peniche, we befriended a crazy local fishing boat captain, Fernando, and a couple of tourist boat captains he had dragged along to our BBQ, who turned out to be great company. They took us to the local tourist attraction, an offshore rock called Ilha Berlenga for lunch (I had never eaten Ray before), and we all got fed well and hilariously trashed on Fernando’s massive fishing boat. One day I woke up and realised I had a flight to catch: It was time for a week-long holiday from my holiday to Austria for a family event. Following my break, I was joined by Victor the Bavarian, an experienced sailor. I also had a couple of other people lined up, but while people love to chat for a bit (not a big deal), some like to flirt it all the way up and announce their arrival dates and everything – they just don’t bother with the actual showing up bit (much to my annoyance). 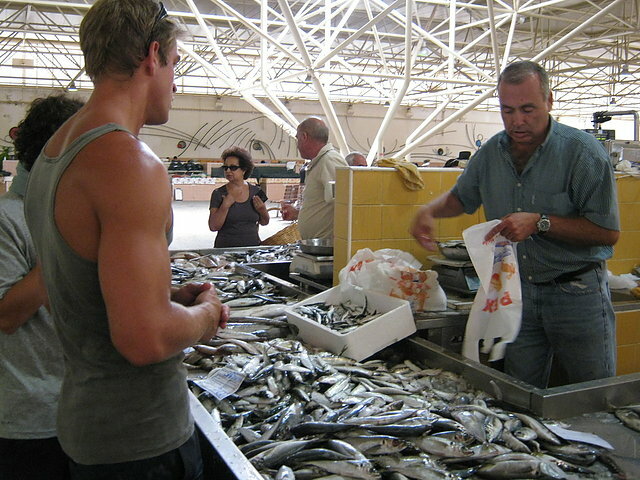 We spent a couple of days in Peniche, attended a Sardineira (free sardines giveaway), had more sardines and choco BBQ on the boat, and attended a festival in a nearby village (name of both escapes me at the moment). We then went on an overnight leg to Cascais. Fernando had kindly given me the coordinates for his private buoy there, since the marina is famously overpriced, but the waterborne cops turned up to inform me that the buoy is registered for fishing boats only, blabla, while he was – perhaps involuntarily – doing his best to make me laugh with his broad rambo stance and evil sunglasses. Just for the record: The police are NOT my friend. Especially when they force me to anchor and use my tiny dingy to serve a crew of 4: In Cascais, we were joined for a very brief stint by Swiss friends Eric and Saskia. The wind adhered to the forecast 6-7 NW for a change, and, having anchored quite a ways off the beach, we were unable to collect Victor and Saskia in the dark for health and safety reasons. This meant a better share of the previously purchased food and lager for myself and Eric and a night in a hotel lobby for the landlubber portion of our crew. 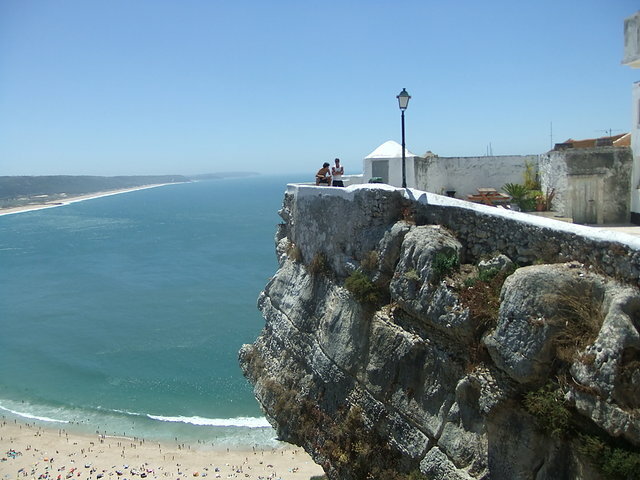 The next day, we set off for Sesimbra. 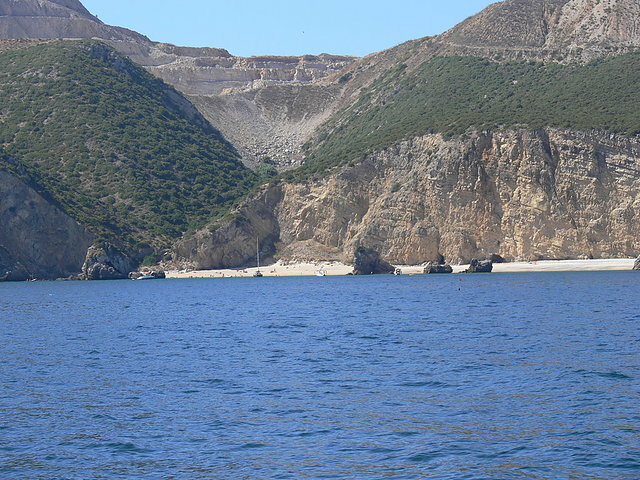 After a few hours of motoring, the journey turned out nicely and we had a brisk sail past Lisboa, and ended up drifting towards the village on the lee side of the cape in scorching heat. Sesimbra turned out to be a touristy but surprisingly pretty place. We spent a night in the overpriced marina (EUR 40! ), which was right next to the sewage facility. It took us a fair while to work out where that stench was coming from. Another sardine bbq later, Eric and Saskia sadly had to leave on other holiday engagements (its a hard knock life, as Jay Z sang in his more savoury days prior to his merger with post-modern pop music). 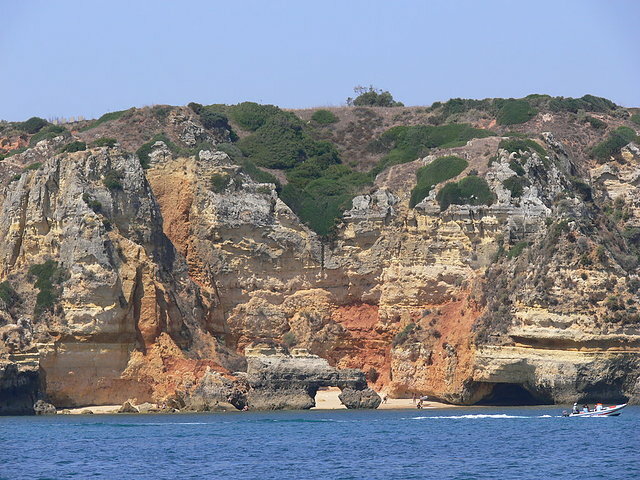 We then anchored off the beach for a day or two, before travelling to the Algarve – we stopped over at Sines, an industrial port, which turned out to be not nearly as ugly as promised – something I cannot say of Lagos sadly. Even though I enjoyed partying this Britaineer-dominated place on an interrail trip a couple of semestres ago, my comeback tour was more than upsetting. I’m not sure if it was the marina fee (EUR 60!! ), the overnight trip there (motoring in heavy swell all night long) or the Australian flyer dude (who nearly annoyed anyone for the last time ever when he jumped into my face that night). 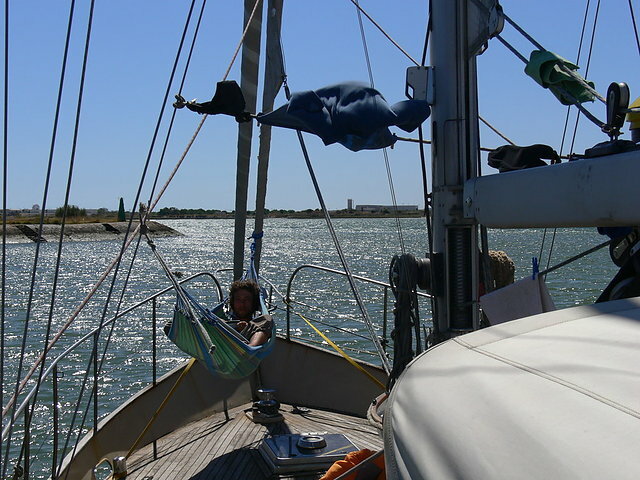 Be that as it may, we departed uggers Lagos the next day and spent a day at anchor and snorkelling the delightful rocky coast of the Algarve, followed by an overnight trip to Tavira, where I met some friends of the family. 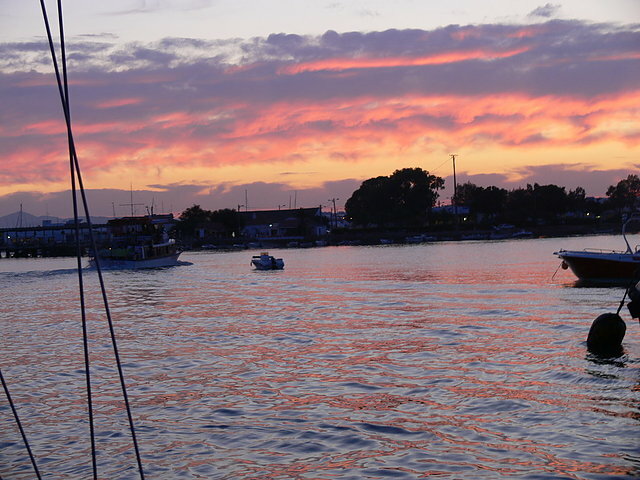 Victor departed to see his missus, leaving me to relax and enjoy the beauty of Tavira – touristy in a low-scale, camp site and tiny town way – and its many young Portuguese and Spanish visitors. 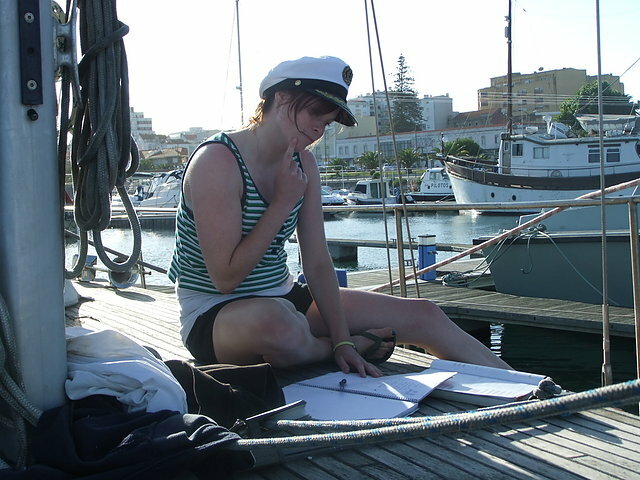 We did get rather confused on several occasions and even considered spending the winter at anchor here. After a week at anchor (EUR 0.00 🙂 I was joined by Reinhard, a well-travelled mechanic from Germany, who has actually motorcycled around the world before. 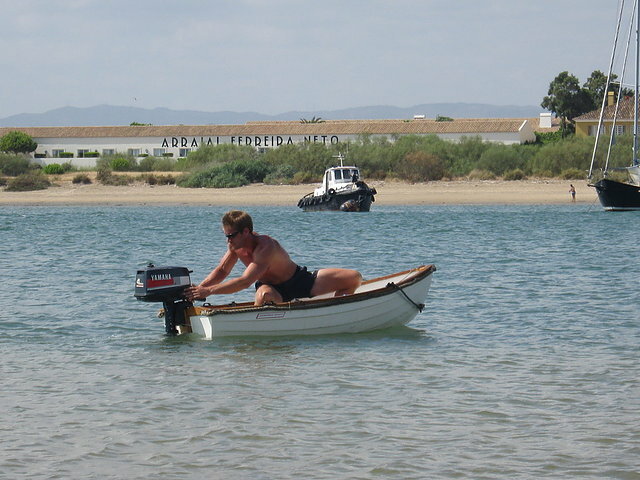 He immediately attacked the outboard issues I’d been attempting to bodge in Figueira (calibration of carb, cleaning of a tiny valve), making little boaty much faster – and life at anchor much more pleasant. Thanks Reinhard! We caught a rope in the prop in town, so we were back to rowing speed for a day whilst we were searching for the correct type of pin. (You can still see me carrying around the Yamaha prop in the next pic hehe). Sigh.. Around this time, we were joined by the two couchsurfers Timo and Anthony. Timo has his own blog [German] by the way. We were just hanging out doing some touristy prancing about town, something I’m usually not too prone to do, but we were waiting and waiting for the Portuguese postal service to deliver a package from home to our friends house. Even though I might add that hanging out in one of the more tasteful tourist resorts in the Algarve in August isn’t all that bad. Naturally, we had another sardine and choco BBQ in true Portuguese style – i.e. 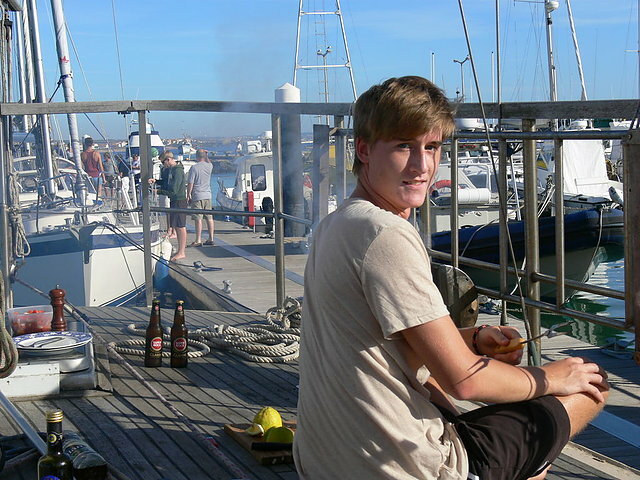 get covered in squid ink, olive oil and lager, the jump overboard for a quick rinse – before we departed for Ayamonte in the Guadiana river, which separates Spain and Portugal at the southern end. We actually went to the more touristy Ilha Cristina first, but were refused entry to the marina because monster is just too monstrous. The woman at reception claimed that she had told me so in our radio exchange upon approach – but obviously not waited for me to confirm this. Grrr. 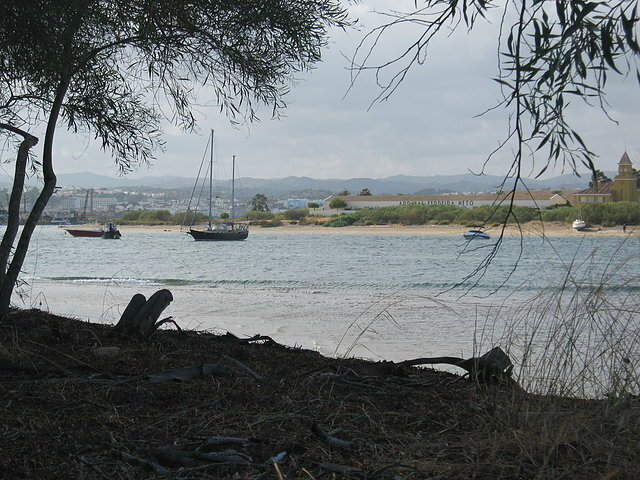 So back out and around to Guadiana it was. 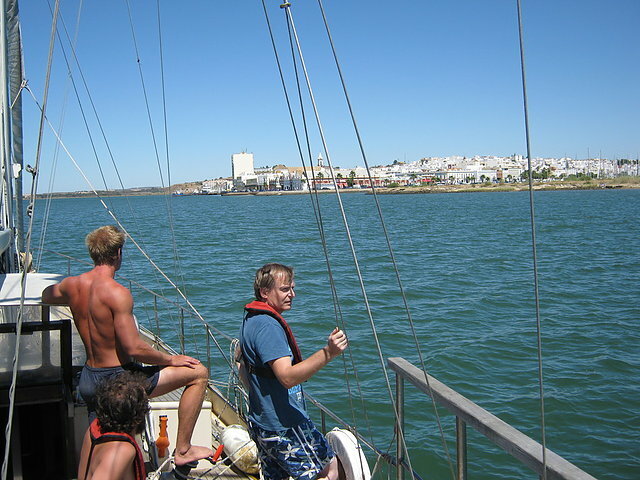 Ayamonte is a lovely and relaxed place a few miles up the Guadiana. My packages have finally arrived, and time to move on it is.